I’ll be honest, I am having a hard time with this one. But it’s either I write about this now, or it never gets documented in the history of the greatest World Series ever played. This heartbreaker never gets told through my words and won’t be on this blog someday for my son to read about. He deserves to know what I thought about this game, because in my life in baseball; it was the greatest game of all time. They will speak of this game after I am long gone. The Dodgers last night showed me that they were every bit the Haley’s Comet type team; the once in a century type team that I thought they were. Otherwise, we don’t get the Hollywood script that last night’s masterpiece ended up resulting in. I realize – or at least I think that the Dodgers season likely ended last night with Justin Verlander coming out on Halloween night in game six. Yasiel Puig and others say there will be a game six. They’re playing the part of John Wayne still as they have so many damn times this season. As they did until the bitter end last night. It’s nice to hear these things. Maybe these guys have one more rabbit left in the hat. Maybe the joke is on me for doubting them. Maybe they’re champions after all. Maybe they’re saving their greatest act and greatest comeback; in a season that has had so many of them and has succeeded in getting me so attached to this bunch, for the very last scene. 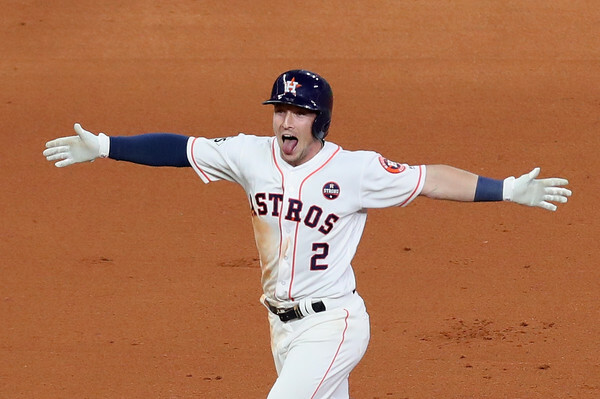 “They’re celebrating right now,” Jansen said of the Astros. “Guess what? They’ve still got to beat us one more time. And the fact that we’re going to go home, we’ve just got to continue to grind. If you take the Dodgers at their word, they still believe. Just like they did when I thought they were done during the dreadful losing streak. I just can’t get over the heroics of some of these guys. Even in a losing effort. I can’t get past what I saw last night from the likes of Cody Bellinger, Corey Seager, Chris Taylor, I mean you go on down the line. Puig, Logan Forsythe, Austin Barnes. They just kept coming back, and coming back, and coming back after most teams would have folded like a cheap tent. That’s what made last night so hard. Knowing that the hero would meet the tragic ending. Knowing that in the end, the hero dies. I’ve probably never been as attached to a team as I have grown to be to the 2017 Dodgers. In my heart, I know that what is once to be will never be again. Other teams get better. Guys get older. There isn’t this five or eight year window where they’re just going to go to the World Series every year. The 104-win regular seasons don’t come along that often. When they do, you can still get caught by a hot team in the playoffs. It was all in front of them at one point. They were so close to delivering what they came to do, and you could tell by the way they played, and battled, and fought until the bitter end with desperation; that they knew what was at stake. It’s like they didn’t lose this game, they just got beat. The Astros just took it. It’s the first time in a losing effort that I ever remember feeling like the losing team had shown they had the mark of a champion. This was a 12 round heavyweight fight from both sides. That’s the best way to describe it. The world is talking about what went down in this game. And it’s recapped elsewhere on the internet. I don’t want to do it here. So I won’t talk about how I woke up today upset with Clayton Kershaw, or Dave Roberts hanging Brandon Morrow out to dry, or umpire Bill Miller, or Corey Seager, Chris Taylor, Yasiel Puig, and Cody Bellinger heroics. I won’t talk about all the inches that this game could have went different. It’s just too painful. It’s like I am recovering from a death. The death of a dream. The season I ventured all the way to Los Angeles and fell in love with a city and a team. The sun rises one more time. It rises at least one more time. And I’ve doubted my own initial gut feeling on the Dodgers before and been wrong. They seem to think they’re going to pull off a miracle to pull the summer sun up into the sky one more time before it sets on this season. I’m quoting Vin Scully. I need the magic of Dodger Stadium that I’ve felt within my very bones to show up just one more time. I’m not ready to say goodbye yet. They’re not going out this way. They can’t be. Simply can’t be. Don’t let summer be done yet Dodgers. It’s been too magical of a ride. Find a way. Find a way or die trying.